Big bore semi-automatic handguns make for some of the most effective self defense pistols on the market today. 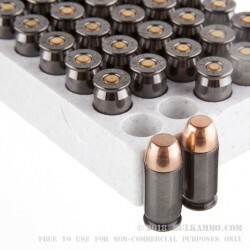 With the Browning 230 grain .45 ACP Performance Target Full Metal Jacket, self defense ammunition has been elevated to a whole new level, and will never be the same. The Browning 230gr .45 ACP BPT FMJ feature Browning’s signature X-Point technology. X-Point engineered bullets will not prematurely expand upon impact with intermediary surfaces, and are renown for their stability in flight. 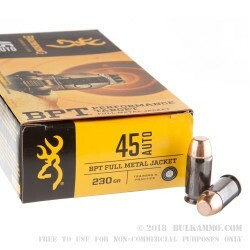 The bonded copper jacket is perfectly balanced along the bullet x-axis, and provides some of highest bullet retention of any .45 caliber round in its class. 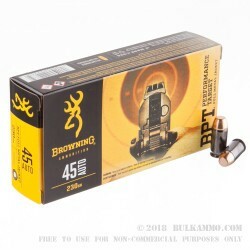 Nickel plated brass cartridges ensure a smooth feeding and extraction after every shot, and at an average muzzle velocity of 920 feet per second, the Browning 230gr .45 ACP BPT FMJ is one of the hardest hitting .45 to ever come into production today. For those who are willing to spare no expense, the Browning 230gr .45 ACP BPT FMJ is one the premier self defense rounds of the modern shooting era.